Dave Gahan (/ɡɑːn/; born David Callcott; 9 May 1962) is an English singer-songwriter, best known as the lead singer of the electronic band Depeche Mode since their debut in 1980. Q magazine ranked Gahan No. 73 on its list of the "100 Greatest Singers" and No. 27 on its list of "The 100 Greatest Frontmen". Gahan is known for his "commanding presence on stage" and his "huge, deep baritone voice". Although his bandmate Martin Gore continues to be the main songwriter for Depeche Mode, Gahan has contributed a number of songs to the albums Playing the Angel (2005), Sounds of the Universe (2009), Delta Machine (2013) and Spirit (2017). Four of these songs were released as singles, including "Suffer Well" in 2005, "Hole to Feed" in 2009, "Should Be Higher" in 2013, and "Cover Me" in 2017. 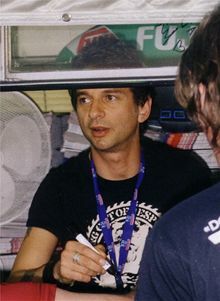 Gahan was born as David Callcott on 9 May 1962 into a working-class family, to parents Len Callcott (a bus driver) of Indian Malaysian descent and his wife Sylvia (a conductress or "clippy" on London buses), Dave was only six months old when his father left the family. Sylvia and Len divorced two years later and his mother moved Dave and sister Sue (born 1960) to Basildon, Essex, after Sylvia met and married her second husband Jack Gahan (an administrator with Shell Oil). The Gahan family continued to grow with the birth of two more half-brothers Peter (born 1966) and Phil (born 1968). Dave and Sue were raised under the impression that their mother's second husband, Jack, was their natural father. In 1972, when Gahan was 10 years old, his stepfather died. Gahan recalled how he "came home one day and found this bloke [his biological father] at home". Of the incident, he has said: "I'll never forget that day. When I came home from school, there was this stranger in my mum's house. My mother introduced him to me as my real dad. I remember I said, that was impossible because my father was dead. How was I supposed to know who that man was? From that day on, Len often visited the house, until one year later he disappeared again. Forever this time. Since then he had no contact with us. By growing older, I thought about him more and more. The only thing my mother would say, was that he moved out to Jersey to open a hotel." "Mum had kept it back from me 'til there was a need to tell me about my birth father, it's a different generation and you can understand I guess she thought she was doing the right thing." While attending Barstable School on Timberlog Close in Basildon, Gahan started playing truant, got into trouble with the police, was suspended from school and ended up in juvenile court three times for offences ranging from joyriding and graffiti to criminal damage and theft. He enjoyed the thrill of stealing cars, driving them around, and setting them alight. Gahan tells of the time: "I was pretty wild. I loved the excitement of nicking a motor, screeching off and being chased by the police. Hiding behind the wall with your heart beating gives you a real kick – 'will they get you?'". In his final year at school, he applied for a job as an apprentice fitter with North Thames Gas. He was told by his probation officer to be honest with the interviewer, and as a result, he admitted his criminal record but claimed he was a "reformed character." As a result, he did not get the job which, he claimed, led to him trashing his probation officer's office. His punishment was weekend custody at a sub-Borstal attendance centre in Romford for one year. Gahan recalls: "You had to work. I remember doing boxing, stuff like that. You had to have your hair cut. It was every weekend, so you were deprived of your weekend and it seemed like forever. I was told very clearly that my next thing was detention centre. To be honest, music saved me." Gahan with Depeche Mode in 2009. In March 1980, Martin Gore, Andy Fletcher and Vince Clarke formed the band Composition of Sound, with Clarke on vocals and guitar, Gore on keyboards and Fletcher on bass. Clarke and Fletcher soon switched to synthesizers. The same year, Gahan joined the band after Clarke heard him perform David Bowie's "Heroes." The band was soon renamed Depeche Mode, a name suggested by Gahan after he had come across a fashion magazine called Dépêche-mode. A new wave/synthpop pioneer of the early 1980s, Depeche Mode have released 14 studio albums, four greatest hits compilations and two remix albums. The band has achieved global sales in excess of 100 million records. In a 2003 interview, Gahan shared that "During the making of Exciter, sometimes I felt a bit frustrated that there was a lack of experimentation." This led him, in 2004, to tell his bandmates that he wanted to write half of the songs on their next album, and there was "no way" he could be involved in the band without contributing as a songwriter. Eventually, there was a compromise, and three of Gahan's songs appeared on 2005's Playing the Angel: "Suffer Well" (nominated for a Grammy award), "I Want It All" and "Nothing's Impossible." "Suffer Well" was released as a single in 2006, reaching No. 12 in the UK. Three more Gahan-penned songs, co-written with Christian Eigner and Andrew Phillpott, appeared on the band's twelfth album, Sounds of the Universe (2009); the songs are "Hole to Feed", "Come Back" and "Miles Away / The Truth Is". Gahan also wrote the lyrics to the B-side "Oh Well", although the music was written by Martin Gore. It was their first writing collaboration. "Hole to Feed" was released along with Gore's "Fragile Tension" as a double A-side single in late 2009. Gahan is credited with writing the songs "Broken", "Secret to the End", the single "Should Be Higher" and two B-sides, "Happens All the Time" and "All That's Mine" from Depeche Mode's thirteenth album Delta Machine (2013); the co-writer for these songs was Kurt Uenala. Gahan also wrote a song with Martin Gore called "Long Time Lie". On their 2017 album Spirit, Gahan is credited as a co-writer of the songs "You Move", "Cover Me", "Poison Heart" and "No More (This Is the Last Time)". Gahan signing autographs in 2003. In 1997, Gahan contributed to the tribute album Dream Home Heartaches: Remaking/Remodeling Roxy Music with the song "A Song For Europe". Gahan did a collaboration in 2003 with Junkie XL and handled the vocals for a song called "Reload" for this Dutch DJ's album Radio JXL: A Broadcast from the Computer Hell Cabin. In 2003, Gahan released his first solo album, Paper Monsters (which he co-wrote with guitarist and friend Knox Chandler), followed by the Paper Monsters Tour (including a performance at 2003's Glastonbury Festival), singing both his new solo tracks and Depeche Mode fan favourites. The album was a moderate success. The first single "Dirty Sticky Floors" hit the Top 20 in the UK Singles Chart. The album became a Top 10 hit on the European album chart and a Top 40 hit in the UK Albums Chart. This success was backed by a world tour and a live DVD titled Live Monsters which was released in 2004. In 2007, Gahan announced he was working on a new album via a video greeting for Depeche Mode's official website recorded at the 2007 MusiCares Charity event on 11 May. The album, entitled Hourglass, was accompanied working by Andrew Phillpott and Christian Eigner. The material was recorded at Gahan's 11th Floor Studios in New York City. According to Gahan, Hourglass is more electronic-sounding than Paper Monsters. The album made the UK Top 50, the French Top 20 and narrowly missed going to No. 1 in Germany. The first single to be pulled from Hourglass was "Kingdom". The single spent a week at No. 1 on the US Dance Chart. The second single from Hourglass was the double A side "Saw Something/Deeper and deeper", released on 14 January 2008. The accompanying video was artistically shot in the Chelsea Hotel, New York, notorious for the death of Sid Vicious' partner, Nancy Spungen. In July 2007, Side-Line magazine revealed that Gahan had been working with Thomas Anselmi on a project called Mirror, which was produced by Vincent Jones. Along with Jones, who played with Gahan's touring band and mixed the live DVD Live Monsters, Mirror featured another Gahan collaborator, Knox Chandler (Siouxsie & the Banshees, the Psychedelic Furs), as well as piano by Bowie favourite Mike Garson, and a monologue by Warhol superstar Joe Dallesandro. Gahan sang vocals on the track "Nostalgia". The song was released in October 2008, and the album released via download at the start of 2009. He also appeared in the accompanying video for the song. Gahan also contributed vocals to a track called "Visitors", after walking in while producer and ex-Clor guitarist Luke Smith was working on the song in his New York studio. The song was released under the artist name of frYars. Gahan is the lead singer and lyricist on Soulsavers' fourth studio album The Light the Dead See. The album was released on 21 May 2012. Gahan sings and plays harmonica on "Low Guns", the first single from the 2014 album The Morning After by English band SixToes. The single was released on 18 November 2013. The SixToes remix of "Jezebel" was released on the special edition of Sounds of the Universe in 2009. Members of SixToes also collaborated with Soulsavers, on the album The Light the Dead See. Gahan was the lead singer and lyricist on Soulsavers' fifth studio album Angels & Ghosts which was released in 2015. Gahan has lived in New York City since 1997. He lives with his third wife, Jennifer Sklias; their daughter; and Sklias's son from a previous relationship, whom Gahan officially adopted in 2010. Gahan also has a biological son named Jack from his first marriage to Joanne Fox. Gahan's marriage to his second wife, Teresa Conroy, a former Depeche Mode publicist, lasted four years. Gahan is a convert to the Greek Orthodox Church. Gahan is a recovering heroin addict. He has survived four brushes with death, living up to the nickname "The Cat", which paramedics gave him during his roughest years in Los Angeles. In October 1993, Gahan suffered a minor drug-induced heart attack during a performance in New Orleans, leaving his bandmates to improvise an encore without him. The second brush came when he attempted suicide by slashing his wrists in August 1995: "It was definitely a suicide attempt," said Gahan, "but it was also a cry for help. I made sure there were people who might find me". On 28 May 1996, Gahan overdosed on a speedball at the Sunset Marquis Hotel in Los Angeles, which resulted in his heart stopping for two minutes until he was revived by paramedics. He said of the experience, "All I saw and all I felt at first was complete darkness. I've never been in a space that was blacker, and I remember feeling that whatever it was I was doing, it was really wrong. Then the next thing I remember was seeing myself on the floor, on the steps outside my hotel bathroom, and there was a lot of activity going on around me. I tried to shout out "I'm up here!" from wherever it was I was floating but nobody could hear me. In some ways it was very liberating. Then I came to and a cop was handcuffing me. It certainly wasn't a place I'd like to visit again." Several months later, after facing drug charges, Gahan sought help at a rehabilitation center. In May 2011, Gahan was honored at the seventh annual MusiCares MAP Fund Benefit Concert in Los Angeles for achieving more than 10 years of sobriety. 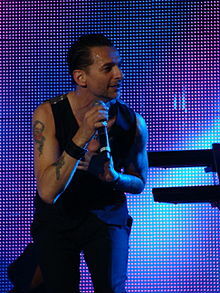 On 12 May 2009, shortly before the band were due onstage in Athens, Greece, for a concert on Depeche Mode's Tour of the Universe, Gahan fell ill in his dressing room. He was rushed to hospital where it was initially suspected he was suffering from a bout of gastroenteritis. An ultrasound revealed a malignant tumor in his bladder, which was removed. This resulted in several postponed shows, and Gahan underwent cancer treatments during the remaining three months of the tour. Gahan later suffered a torn calf muscle while performing in Bilbao, Spain, on 9 July 2009, resulting in two further cancellations. After a two-week break, he and Depeche Mode returned to the tour for their North American leg. While performing in Seattle on 10 August 2009, Gahan again suffered injury, this time straining his vocal cords. Doctors ordered Gahan on complete vocal rest, resulting in two more cancelled shows. ^ "Rocklist.net...Q Magazine Lists". Rocklistmusic.co.uk. Retrieved 14 May 2012. ^ "Q286 Exclusive preview". News.qthemusic.com. Archived from the original on 5 May 2012. Retrieved 14 May 2012. ^ "Depeche Mode delights the masses during its first of four record-setting evenings at the Hollywood Bowl". Dailynews.com. 13 October 2017. Retrieved 3 April 2019. ^ "Depeche Mode's Dave Gahan: why I don't understand my own band". Newstatesman.com. Retrieved 3 April 2019. ^ "Depeche Mode Biography David Gahan". Retrieved 18 November 2016. ^ a b "The Big Uncertainty Of Depeche Mode's Dave Gahan" (1987) Archived 13 February 2005 at the Wayback Machine, tuug.utu.fi; retrieved 21 June 2010. ^ Fansite; accessed 22 March 2015. ^ a b Spence, Simon (2011). Just Can't Get Enough: The Making of Depeche Mode. Jawbone Press. p. 89. ISBN 978-1-906002-56-5. ^ Miller, Jonathan (2004). Stripped: The True Story of Depeche Mode. Omnibus Press. p. 31. ISBN 1-84449-415-2. ^ Dalton, Stephen. "Just Can't Get Enough". Uncut (May 2001): 45. ^ a b Stokes, Paul. "Cash For Questions: Dave Gahan". Q Magazine (June 2003). Archived from the original on 24 July 2011. Retrieved 30 October 2011. ^ ""New Depeche Mode album number one in 20 countries" Archived 6 June 2011 at the Wayback Machine, EmiMusic.com, 1 May 2009. ^ Zonkel, Phillip. "Gahan no longer in such a hurry", Daily News (Los Angeles), 24 August 2003. ^ Quan, Denise. "A Sobering Interview with Depeche Mode". CNN.com. 13 May 2009. ^ "Depeche Mode present birth first song in 4 video postings" Side-Line.com. 24 November 2008. ^ "David Gahan of Depeche Mode Working on New Solo Album Archived 26 May 2007 at the Wayback Machine" ArtisanNews.com. 24 May 2007. ^ "Dave Gahan Set to Release 'Hourglass,' His Second Solo Album in Late October Archived 27 June 2007 at the Wayback Machine" DaveGahan.com. 26 June 2007. ^ "Dave Gahan to release second solo album 'Hourglass'" Side-Line.com. 28 June 2007. ^ "Depeche Mode frontman announces first new solo single" Side-Line.com. 7 August 2007. ^ "More info on upcoming Dave Gahan (Depeche Mode) single" Side-line.com. 16 August 2007. ^ "Depeche Mode's Dave Gahan contributes vocals to new Mirror project", Side-Line.com, 17 July 2007. ^ ""Depeche Mode's Dave Gahan contribution to Mirror album 'Mirror' out now", Side-Line.com, 3 October 2008. ^ "Thomas Anselmi: Mirror". SuicideGirls.com. 9 March 2009. Retrieved 10 March 2009. ^ "Depeche Mode singer Dave Gahan invites himself as singer on 'Visitors' from fryars debut 'Dark Young Hearts'", Side-Line.com, 10 November 2008. ^ Spokony, Sam (1 March 2012). "Dave Gahan Discusses Soulsavers & New DM". The Quietus. Retrieved 2 March 2012. ^ Stovin, Jack (3 October 2013). "SixToes collaborate with Dave Gahan of Depeche Mode". AltSounds. Archived from the original on 4 October 2013. Retrieved 4 October 2013. ^ Aquilante, Dan: "Q&A: DAVE GAHAN" NYPost.com. 19 April 2009. Retrieved 21 June 2010. ^ Old News – The Archives, Depechemodedotcom, 27 March 2010; retrieved 4 December 2013. ^ Dave Gahan bio, IMDb.com; accessed 24 March 2015. ^ Sanidopoulos, John. "Dave Gahan of Depeche Mode A Convert to Orthodoxy". Johnsanidopoulos.com. Retrieved 3 April 2019. ^ a b Cameron, Keith (18 January 1997). "Dead man talking". NME. Archived from the original on 24 July 2011. Retrieved 30 October 2011. ^ Dalton, Stephen. "Just Can't Get Enough". Uncut (May 2001). Archived from the original on 24 July 2011. Retrieved 30 October 2011. ^ Grundy, Gareth. "Dead man talking". Arena (April 1997). Archived from the original on 8 October 2011. Retrieved 30 October 2011. ^ "Dave Gahan: Madness à la mode". The Independent. 30 May 2003. Retrieved 3 April 2019. ^ "Depeche Mode singer honored at L.A. sobriety event". Reuters.com. 7 May 2011. Retrieved 3 April 2019. ^ Wilson, MacKenzie. "MusiCares Salutes Depeche Mode's Dave Gahan for Staying Sober". BBC America. Retrieved 3 April 2019. ^ "depeche mode dot com". Depechemode.com. Archived from the original on 26 March 2011. Retrieved 19 August 2010. ^ "Depeche Mode frontman Dave Gahan opens up about his battle with cancer - NME". NME. 1 May 2013. Retrieved 25 February 2017. ^ "Depeche Mode Singer Has Cancer Scare". E! News. Retrieved 25 February 2017. ^ Jurgensen, John. "Depeche Mode's Dave Gahan on Rock, Ringtones, and Remission". Wall Street Journal. Retrieved 25 February 2017. ^ "Dave Gahan injured – Depeche Mode Cancel Final 2 Shows in Europe" Side-Line.com. 13 July 2009. ^ "Depeche Mode Cancel Gig Due to Another Dave Gahan Illness", Spinner.com, 12 August 2009. ^ Yet "Another Depeche Mode Concert Canceled", Side-Line.com, 17 August 2009. Wikimedia Commons has media related to Dave Gahan.